I made this as part of the art by the inch challenge in October. 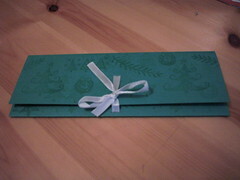 It's a gift wallet for a monetary present. Stamped in green ink on green card, white ribbon for tying. BTW, I got the next issue of that part-work. Haven't opened it yet though. Oh please no, I have enough crap at home already!